The project aims to encourage intergenerational learning (IGL) by exploring cross cultural experiences, best practices and methodologies within Europe and the wider life-long learning community. The EU pays particular attention to its aging population and 2012 is designated as the year of Active Aging and Intergenerational Solidarity. Some European countries have already developed IGL methods and tools, but there is still a gab that needs to be filled with knowledge and expertise. The project will introduce formal and informal practices of IGL that bring Elders and younger generations closer together, such as tandem formation, IGL communication and cooperation techniques. The partners involved will provide practical knowledge in IGL and cooperation in different social aspects such as the working environment, social clubs and networks. To achieve the main goal of the project, the partners will initially exchange information on local structure and experiences of IG-Learning and the acquisition of key competences. The guide will have a specific structure that will include its relevance to EU policies, methods, practices and approaches. At a second stage, the partners will host study visits in each country meeting, so that visiting partners experience different practices from first hand. The coordinating institution will gather experiences and partner feedback reports, which will be the main body of the best practice guide. In the third stage, the partners will test the developed instruments through the creation of tandems of elders, middle aged and young people, while the guide will keep evolving. Finally, the partners will evaluate the project activities and produce a report describing the various phases and activities of the project; leading to the Best Practice guide. The main aim of the project is to foster intergenerational cooperation and learning. The partnership will bring together young people and elders through their normal course of action. The visiting partners will have the opportunity to experience different methods and approaches in IG learning. The partnership will gather the experiences and practices of partners and it will add certain practices and approaches on IG Learning across Europe. Finally, a best practice guide will be compiled to a single compendium with the knowledge acquired from the partnership. -The increase of knowledge on different methods, practices and approaches in different EU countries, such as tandem -formation, ICT learning, communication skills. -To raise awareness about the needs and educational priorities of young people and elders and how younger generations can support the elders. Initially, there will be an exchange of partner experiences related to IG learning and the distribution of tasks between partners at the kick-off meeting. The final meeting, during which the partners make a summary and evaluation of the final output and the project in general. Preparation of the final report describing progress of the project and its effects. The project requires from each partner to provide input from experiences and practices from his country and organization. The idea derived from partner contributions and the workload was allocated based on each partner specific capacity and expertise. Kivotos will provide management and coordination of the partnership, facilitate communication, dissemination, resolve any possible issues and mediate on possible problems that might arise. Each hosting partner at the meeting will have to organize a study visit; something that would ensure the active contribution of each partner through field work. Also, each partner has to provide input and feedback in the creation of the best practice guide throughout the project lifetime. The edit of our guide will be done by Kivotos. At all project stages, there will be an exchange of experiences and methodologies on Intergenerational learning and cooperation from field experiences. The monitoring of the project will be enriched by the creation of a Steering Committee composed of a member from each partner which will convene at each country meeting. Each partner will also have to undertake the supervision of a project outcome and activity based on its own capacity. 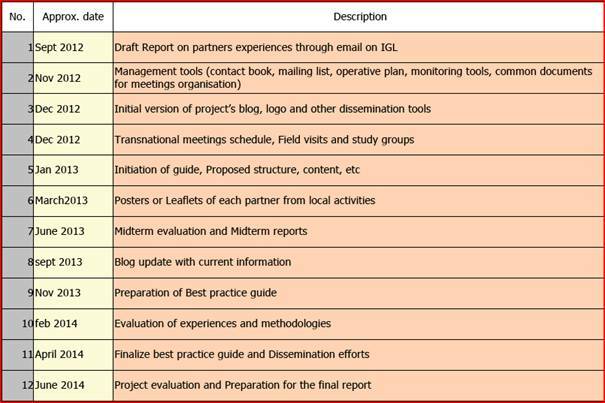 1 Kivotos will be responsible to oversee and create the final output; the best practice guide of methodologies and tools on IGL and Cooperation. It will also provide academic learning on possible causes of conflict and cooperation among generations. 2 The French Partner will be responsible for the creation of the project blog and demonstrate the potential of digital and e-learning methods. 3 The Greek partners will focus on the contribution of young people in local environment/communities cooperating; with other generations, being middle aged or elders. It will also prepare the dissemination material. 4 The Italian partners will provide methods and mediation tools that can enhance cooperation and learning among generations. 5 The Spanish partner will be responsible to supervise the evaluation proceedure of the project, including midterm and final report. 6. Romanian partners will demonstrate the Intergenerational cooperation among young people and adults in the training field and at workplace. All partners will also contribute in the dissemination activities of the project through their local and European contacts. It should be noted that the partner tasks and outputs will be generated by an IGL process; by individuals of different ages working together. The effective cooperation of the partnership will be assured by a Steering Committee, composed by a representative of the partner institutions. Under the overall responsibility of the coordinating partner, the SC members will keep direct day-to-day contact through e-mail, skype conference meetings and phone. In each country meeting a separate meeting of the steering committee members will be taking place. Its function is to analyse the state of affairs, the planning of future steps, suggestions on improvement of the project functionality and to take necessary measures, if required. The steering committee will agree on the key milestones of the project, analyse the previous project phase and decide on further steps in the work plan for reaching the project aims. The project coordinator and the sub-coordinators for separate items inform on project progress and agree on necessary steps, partners’ contributions adjustments in the work plan etc. Finally, the host country will be responsible to disseminate a "Meeting Report" which will summarize what was covered and what was agreed during the partnership meeting. This report will be disseminated to all partners through email. Our partnership focuses both on staff of participating organisations, young and elderly learners but pays more attention to the latter. They will be both actively and intensively involved in the project’s activities. Planning – learners from project target groups (young and elderly people) will be invited to project seminars to discuss together with them their needs on such topics like quality of education, methods of personal development, acquisition of key competences, interest in intergenerational learning. 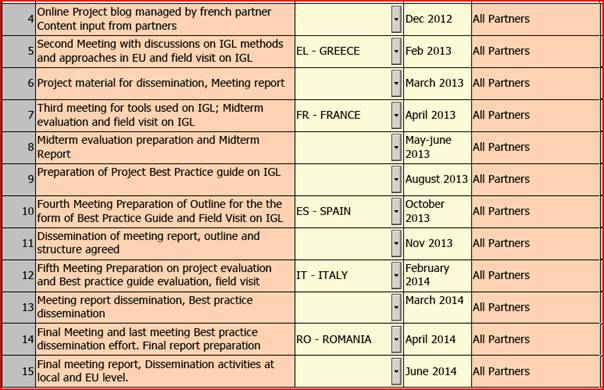 Implemetation – there will be 3-4 activities organized in each partner countries, which will work on IGL methods and the acqusition of key competences. Moreover, in each meeting, partners will have to organize a study visit in order for the rest to withness a best practice example. Evaluation – It will be the outcome of the feedback received from their work/activities and cooperation. Planning – the Staff of participating organisations through mutual cooperation will jointly develop a common approach and tools aimed to facilitate elaboration of best practices through exchange of methods and experiences. The meetings will represent the main planning moments, where partners will have the opportunity to share good practices, participate in study visits and debate on intergenerational learning. Implementation – The staff will have active role in collecting necessary materials and elaborating compendium as well as creating tandems among young people and elders. They will also monitor the work of cooperation tandems and help them go through the project. Evaluation – The staff will be involved in preparing a reports with Intergenerational methods feedback reports. Additionally, they will participate in reporting after each of transnational meeting as well as in preparing intermediate and final report. The partnership is mainly focused on learner involvement and seeks to introduce new learning tools and methodologies through the foreseen guide. Active ageing and solidarity among generations includes creating more opportunities for older people to continue working, to stay healthy longer and to continue to contribute to society in other ways, for example through volunteering needs to be supported by a wide range of policies at all levels of governance. Therefore it is imperative for our organizations to exchange best practices and methodologies among European partners. The partners involved will share their own experiences and enrich their knowledge and understanding from the practices of other partners; towards the process of the project and the creation of the final product. The partners involved cooperate at regular basis with young and elder people in their local areas. The learning derived from the creative interaction of learners, both youngsters and elders, during this project could be a constructive experience for the trainers and staff involved. Local staff will engage with foreign partner's staff in exchanging methodologies and experiences during the process of drafting the guide. The staff will be asked not only to develop, but also to disseminate the new methods and experiences created in the guide to other colleagues and incorporate learning activities in its training. The evaluation process will be directly linked to the monitoring process of the project, as will use the primary quantitative and qualitative data for monitoring. After each meeting there will be an evaluation of the meeting for monitoring purposes of the project and a meeting report will follow from each hosting partner. During the initial meeting, the project flow and tasks will be explained from the coordinating institution and management tools will be explained, including a monitoring plan. That will permit to control if activities are implemented as planned and it will be based on the use of monitoring tool available, the M-tool and it will include the following aspects: communication, local activities, mobilities, active participants/partners involvement, outcomes, evaluation, dissemination, valorisation, community involvement. The evaluation plan will foresee three main areas: management of the project, process and outcomes and will be implemented in different moments of the project’s life: ex-ante, on going and ex-post evaluation. Both, quantitative and qualitative data provided by all partners will be used for evaluations reports and feedback reports will be received during our activities. The data collection will be implemented by use of documents analysis, individual interviews, questionnaires, discussion groups and will concern aspects mentioned above. Both, monitoring and evaluation plan will be discussed and elaborated by all partners at the beginning of the project during the kick-off meeting, the responsible partner for evaluation plan and monitoring plan and reports will be the coordinating organisation. Each participating partner will promote the project within their own organisation. - consolidating the project by integrating it into each organisation’s training programme.